IZ-KARTEX, a subsidiary of the largest Russian heavy engineering company, has completed installation and commissioning of four excavators EKG-10 at coal mine Block-II, owned by Bharat Coking Coal Limited, one of the divisions of India’s state-owned Coal India Limited. The deal for the supply of four EKG-10 excavators was signed in 2013 and is valued at more than $62 million. The contract also includes the maintenance of excavators for 17 years. To ensure that the contract’s conditions are met, IZ-KARTEX has opened in India its own branch and set up a warehouse of spare parts. IZ-KARTEX, named after P.G. Korobkov Ltd., is a subsidiary of OMZ JSC, which is the largest Russian heavy engineering company, specializing in manufacturing of nuclear power plant equipment, mining machinery, metallurgical and petrochemical equipment. The contract represents an important milestone in the revival of long-standing partnership between Indian and Russian companies in the coal sector, after a 14 year-long break: since 1999 Indian coal companies were not purchasing large-scale mining equipment from Russia, Andrey Mironov, director of IZ-KARTEX’s Indian branch, told RIR. The company also sent two experienced Russian excavator operators to India to teach their Indian colleagues the techniques of operating the machinery. According to him, EKG-10 is the excavator of major importance in the electromechanical mining industry in Russia and in the largest raw materials' supplying CIS countries - Ukraine, Kazakhstan and Uzbekistan. Since 1984, the company IZ-KARTEX released more than 500 of these machines and their variations. In addition, Bharat Coking Coal India Limited has announced tenders for four more excavators. IZ-KARTEX also intends to participate in them. Since 1957, IZ-KARTEX has manufactured and delivered over 3500 electric mining shovels, of which more than 1200 machine units are in operation now. IZ-KARTEX mining shovels form the basis of excavation and loading equipment fleet of the largest mining companies in Russia and CIS countries. 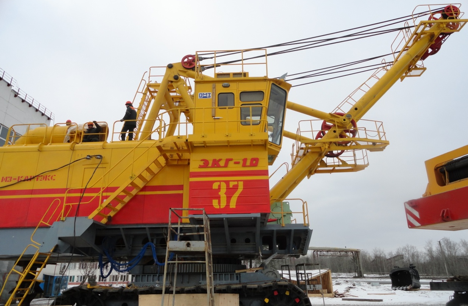 IZ-KARTEX supplies its mining equipment to mining enterprises in Russia, Ukraine, Kazakhstan, Uzbekistan, Mongolia, China, India and other countries. The company’s head office and manufacturing facilities are located in Kolpino, St. Petersburg. The company’s staff comprises 1800 people, with the production area of the enterprise estimated to be more than 120 000 square metres.